The sky at sunset as seen from the Southern Hemisphere, in this case Melbourne Australia. Mercury is at its best this week, joining Mars, Antares, and Alpha and Beta Centauri. The planet Mercury is one of the brightest objects in the sky, but the elusive rocky world is always a challenge to observe, though it is a prime target for planet-seeking observers in the Southern Hemisphere. Because Mercury orbits close to our sun, it never strays far from the sun's bright glow. 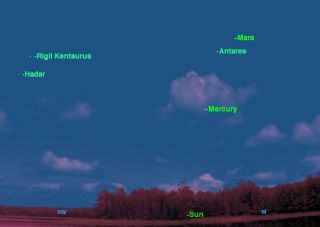 Even when it is farthest from the sun, as it is this week, Mercury's position in the sky often makes it difficult to see. The problem is that the angle which the ecliptic — the path that the sun, moon, and planets follow across the sky — is sometimes tilted so that it makes a shallow angle with the horizon. So, even though Mercury is far from the sun, it is still very close to the horizon at sunset. This is the situation this week for observers in the Northern Hemisphere. As usually happens, a poor angle for northern observers turns out to be a good angle for Southern Hemisphere observers. The sky map accompanying this guide shows the view of as viewed from Melbourne, Australia. From Melbourne, the ecliptic appears to rise almost straight up from the horizon, putting Mercury in a very favorable spot. Mars is even higher above the horizon, and the bright red giant star Antares is between the two. Off to the left are two more bright stars, Rigil Kentaurus and Hadar. "Rigil Kentaurus" is an alternative name for the star system also known as Alpha Centauri, which has been much in the news in the last few days because of the discovery of an Earth-sized planet around one of its component stars. Southern observers may need to wait a while after sunset for the sky to darken enough to let them spot Mercury and its companions; binoculars will help. Northern observers will have a much more difficult time. Mercury, Mars and Antares will be much lower in the sky, way off to the left of the setting sun, and Hadar and Rigil Kentaurus will be completely below their horizon.